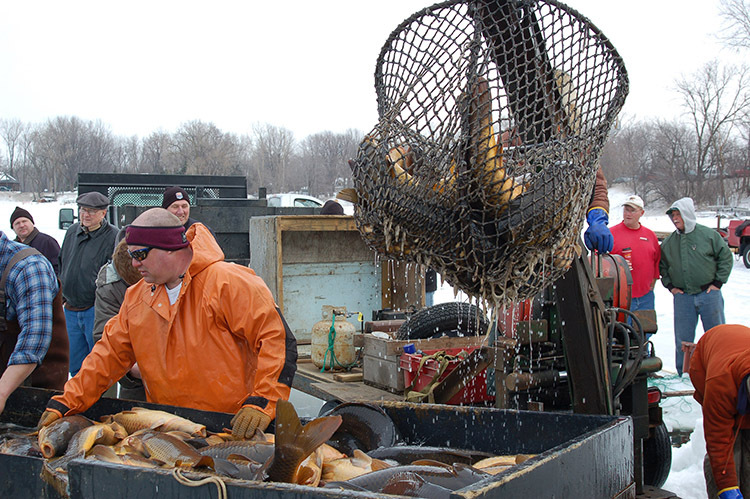 Innovative management has reduced carp in the Phalen Chain by over 60 percent. 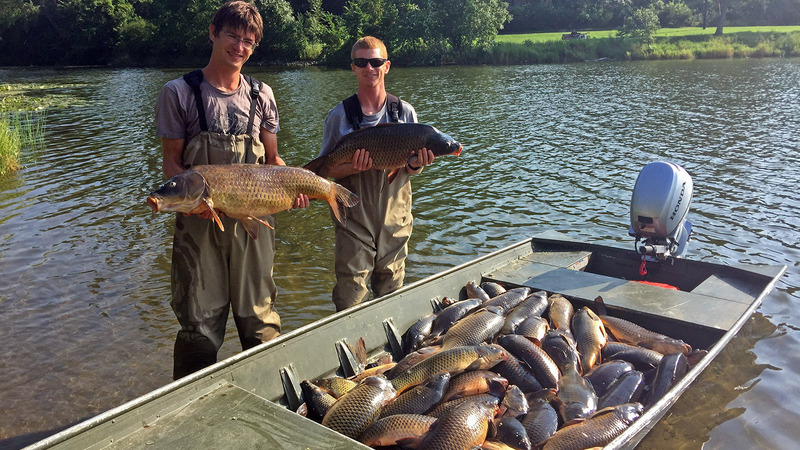 In order to improve water quality in the Phalen Chain of Lakes, we began a long-term carp management program in 2009. Partnering with University of Minnesota researchers, we developed an innovative system to track seasonal carp movements, efficiently net adult carp and prevent young carp from recruiting into the system. The common carp is a non-native invasive fish species to Minnesota and is prevalent in most metro area lakes. Carp can live more than 60 years, and they stir up phosphorous-laden sediment while rooting for food on the bottoms of lakes, rivers and ponds. This activity, along with the carp’s excretion of nutrients, can harm water quality and aquatic plant communities. Carp densities over 90 pounds per acre typically result in negative impacts to lake systems. In 2009, teamed up with the University of Minnesota’s Sorensen Lab on an applied research project to investigate carp in the Phalen Chain. The main objectives were to: 1) determine carp abundance; 2) identify spawning areas; and 3) better understand what influences carp recruitment (maturing from an egg to an adult). Using radio telemetry, the team was able to track carp movements throughout the system at various times of year. The District funded this work along with the Legislative-Citizen Commission on Minnesota Resources (LCCMR). Since the initial research, we have made substantial progress in understanding the carp population and ecology in the Phalen Chain. Through focused management efforts, we have reduced the adult carp density by over 60 percent, from 158 pounds per acre to 55 pounds per acre (average biomass for Kohlman, Gervais, and Keller lakes). We contract with a commercial fisherman to net carp through the ice since they often form large schools during winter. Still, the key to long-term management is limiting carp access to spring spawning grounds. In addition to strategically netting adult carp, we have located key spawning areas and are actively working to eliminate juvenile carp in these waters. To that end, we installed a carp barrier in Kohlman Creek that reduces the number of adult carp migrating into the Kohlman Basin wetlands during spring. We plan to continue managing carp over the the long term in the Phalen Chain.